The lowest bids in two tenders for up to 350 MW of concentrated solar power (CSP) capacity in Morocco have been made by tie-ups led by Saudi Arabia’s ACWA Power and Spanish firm Abengoa, Reuters reported. 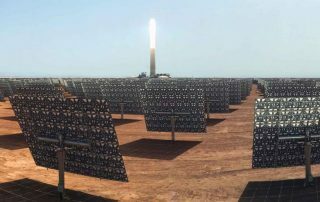 Morocco's first Concentrated Solar Power plant will begin operating in 2015 as part of a multi-billion-euro project the oil-scarce kingdom hopes will satisfy its growing energy needs. The Concentrated Solar Power (CSP) project will back the government’s strategy of harnessing power from the sun through the use of concentrated solar power technology. The Noor-Ouarzazate Concentrated Solar Power (CSP) Complex alone will supply power to 1.1 million Moroccans by 2018. The Moroccan Agency for Solar Energy, MASEN, will attend the most important event for the Concentrated Solar Power industry, CSP Today Sevilla 2014.